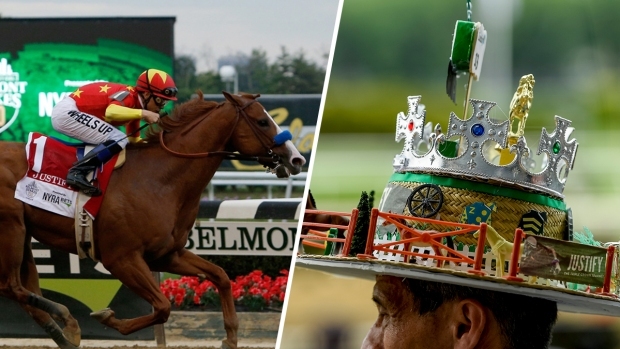 You're not a horse racing expert, but you can act like one for the Belmont Stakes. For all the pomp and circumstance at the track, the real focus will be on the track. Don't know the first thing about horse racing? It doesn't matter. These seven tricks will help you get in on the spectacle as though you do. 1. Learn the lingo, and use it liberally. You'll actually get to know something about racing later. For now, just pepper your comments with some jargon. A horse that's a closer runs his best later in a race, a stayer or router is good at running distances and a front-runner runs best at the head of the field. A horse is pinched back if it's held in close quarters, and if it's boxed in it's shut off or pocketed. Horses' distances from each other in the stretch, or the last straight section of track, are measured by a head, e.g., the length of a horse's head. At the finish line, a photo finish is so close the finish-line camera has to figure out who won, and a dead heat is an exact tie. A horse finishes on the board if he's one of the first four to finish. 2. Know what's at stake, and tell everybody else. 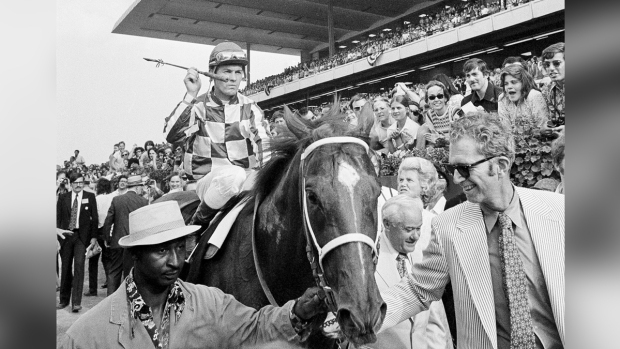 You probably already know that only 12 horses have ever pulled off the feat of winning all three legs of the Triple Crown: the Kentucky Derby, the Preakness Stakes and the Belmont Stakes. The last to manage it was American Pharoah, in 2015. Many have their eyes on Justify, who, after Derby and Preakness wins, could become the 13th Triple Crown winner. 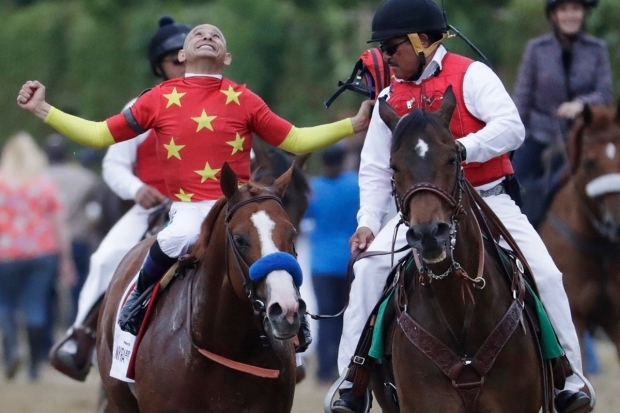 There's plenty that can go wrong for a would-be Triple Crown winner: A great horse can get pocketed or pinched back, especially in the Derby's and the Preakness' crowded fields. Or, in the Belmont, it can be overcome by better-rested rivals that ran in Louisville, then skipped the Preakness. Other horses have had their hopes dashed by jockey error at Belmont, where jockeys' tactics play a bigger role and riders may be tempted to accelerate too early in the comparatively long race. You can't feign some authority on horse racing without concocting a fervently held opinion on which horse will win. Which horse has home-track advantage? What's its breeding like — geared for speed, or distance, or something else? What sort of races has it been running lately? Has it had any injuries? Who trains it? Nothing screams "I know what I'm doing!" like advising your friends on how to spend their money, right? Right — well, as long as your friends aren't big gamblers. In that case, pay close attention. Use Colin Bertram's primer to get a handle on what horses' odds mean and what they don't. Remember, a horse's odds reflect not how likely it is to win but how heavily other people are betting or expected to bet on it to win. The first number tells you how much profit your bet will get you should you win, and the second tells you how much you must bet to get it. If the horse you pick has 3-5 odds at the time of writing, that means you have to bet $5 in order to win $3 profit, so if you bet $10 and your horse wins, you'll get back $16. 5. Trot down Memory Lane. Recall those halcyon days of horse racing — you know, when the only other sports worth their salt were baseball and boxing, and when your parents hadn't even met yet. The mechanics of horse racing have changed plenty over the decades. Wealthy dynastic families ruled breeding, not commercial breeders, and as a result, horses were bred for stamina. Today, they're bred for speed. But most fundamentally, horse racing doesn't have nearly the fan base it did in its heyday, back before pro football, pro basketball, casinos and, well, the internet horned in on its popularity. At racing's zenith, the track was the automatic mecca for gamblers. Now you get to the really fun part of exercising your newfound authority: Breathlessly regaling your friends with tales of great races of yore as though you were there. Bloviate about Secretariat's astounding 1973 Triple Crown, which he won by an unheard-of margin of 31 lengths. As the victor crossed the finish, the runner-up couldn't even fit on the television screen. Wonder what would have happened if Man o' War, ranked the 20th century's best by Blood-Horse magazine and The Associated Press, had ever run for the Triple Crown. It wasn't around yet when Man o' War raced in the early 20th century, though he did sire some Triple Crown horses. If you really want to boost your expert cred, do your homework, and stake out a controversial stance or two. Read up, and weigh in, on hot-button topics like horse breeding habits, nasal strips and the sport's undeniable decline in recent decades, and what could reverse it. Steve Coburn, the co-owner of the 2014 Triple Crown contender California Chrome, grumbled that the growing numbers of Derby contenders that sit out the Preakness before returning for the Belmont have made Triple Crown wins all but impossible. He wanted the rules tweaked so that only colts that run the Preakness can compete at Belmont. He said that year that if his horse didn't win the Triple Crown — which it didn't — he doubted he'd ever see another winner. "There are people out there trying to upset the apple cart," he said. "They don't want a Triple Crown winner. They want a paycheck." A year later, the decades-long Triple Crown drought came to a close as American Pharoah galloped to victory at Belmont, but there has been talk of tinkering with the format and timing of the three key races, and not just among figures who have, quite literally, a horse in the race. Weigh in on what you think should be done, too. But don't limit your expressions of your newfound expertise to such existential hand-wringing. Try picking an underdog to root for June 9. When you place your bet, try a superfecta, naming the top four horses in the order you expect them to place. And whatever other stories you tell your friends, make sure to leave room for one still in the making: the first time you bluffed your way through the Triple Crown. Just wait until the next big race to tell it. By then, you might actually be an expert.